To place an order please contact us at order@smallbarnfarm.com. Email orders should be for pick up at the farm. It is helpful to include what size(s) you are interested in and when you would like to pick up. 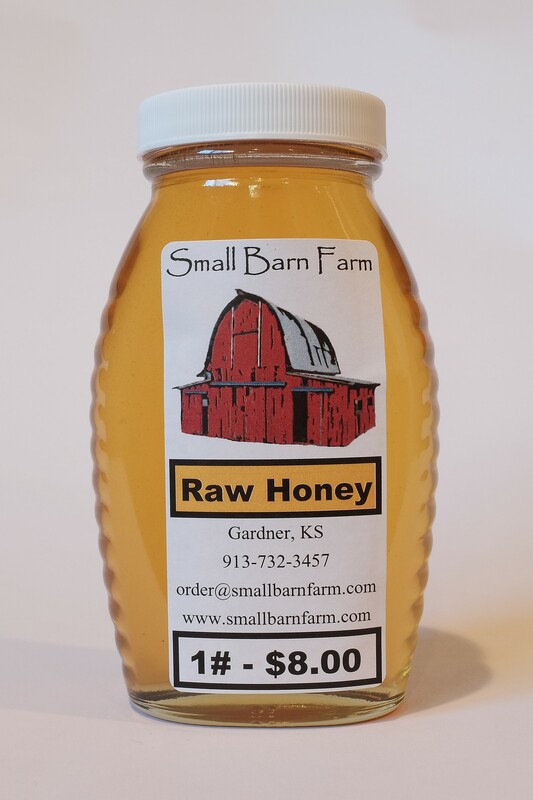 From April until October you can meet us during Farmers Market on most Saturday’s at the Downtown Olathe Farmers Market at the new community center. 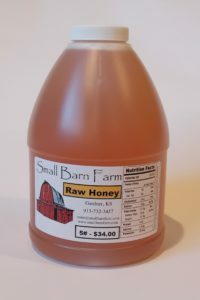 Small Barn Farm is about sustainability and reusing what we have that is one reason we use glass jars. If you return the jar it will be sterilized and recycled! 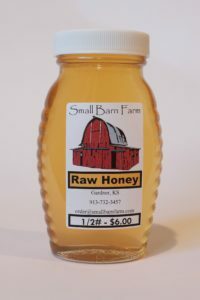 I live in Gardner and was looking for local honey. Where can I buy yours? I’ll send you an email with my contact information! 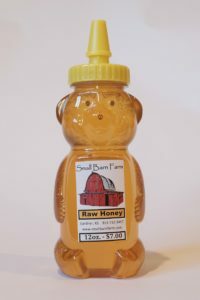 Lovin your honey! 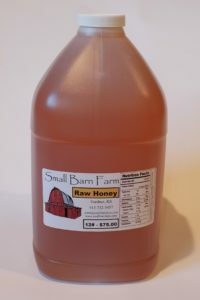 I bought some of your honey at the Farmer’s Market about a month ago. It is sooooo good!!! Just wondering if I can come to the barn and bring my glass jar back and get a refill. My daughter lives in Gardner so I come out that way at least once every 2 weeks. 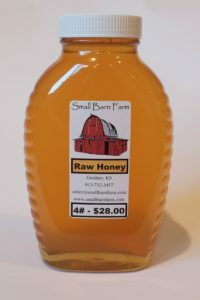 Are you still going to the farmers market in Olathe? Please let me know. I sent you an email! I am so glad you love our honey. I also love your honey! 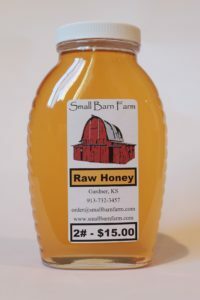 I bought mine at the Olathe farmers’ market a while back and would love to refill my glass jar as well. Will you send me instructions on when/where I need to go to do this? I live in Gardner, so it wouldn’t be far for me to come to you. Hi! I would like to get another 2 pound jar of honey. Could you message me with your location and when I could come by? Thanks! Hi Jill I will send you an email! I am looking for a source locally for beeswax, small amts, 1-2 lb, any chance you could sell me some? So you sell honeycomb or bee pollen? If so, in what quantities and for how much? We don’t do honeycomb, it is really hard on the bees to make the comb and takes a special type of frame to be able to harvest it. We do have bee pollen. $8 for a small jar and $12 for our larger jar. You can find us at the farmers Market on Saturdays in the summer at the Olathe Community Center. Can you tell me your current prices for your honey? 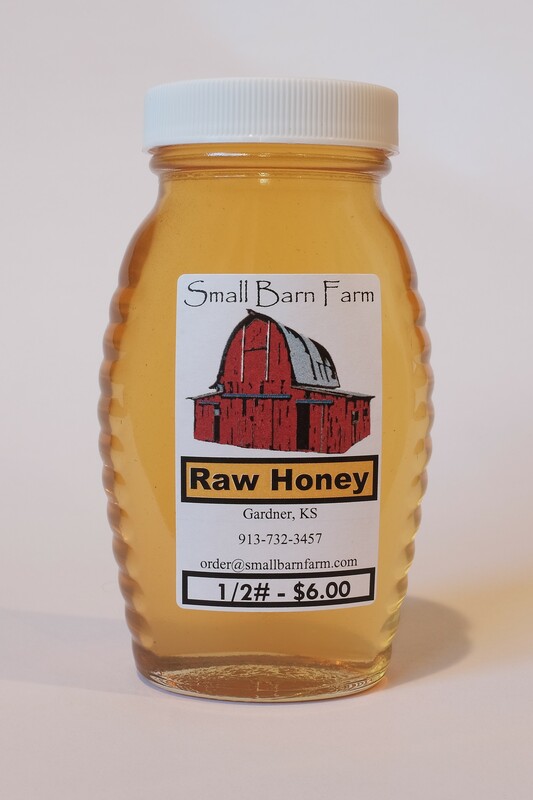 Will you be at the Farmer’s market in Olathe on October 7th?